Physicians should focus on patients’ quality-of-life benefits. According to the Administration on Aging, only 38.5% of men and 31.1% of women between the ages of 65 and 74 exercise regularly. There are, of course, many reasons it’s important to exercise, including extending the life span, boosting energy, improving sleep, and maintaining a healthful weight. Additionally, exercise releases heart hormones that promote weight loss. A study reported that these hormones, called cardiac natriuretic peptides, convert white fat into brown fat, which favors their breakdown.1 Yet with all of these salubrious benefits associated with exercise, fewer than 40% of elders are actively exercising. So why aren’t more of your elder patients exercising? The answer possibly lies in understanding what’s important to patients and how to use that information to effectively communicate the benefits of exercise. And that’s precisely what a study published in the International Journal of Behavioral Nutrition and Physical Activity reported. The study investigated the concept of rebranding exercise by examining the values and behaviors of healthy middle-aged women.2 It scrutinized the gap that exists between starting an exercise program and sticking with it. Rebranding refers to the notion that exercise hasn’t been positioned in people’s minds as well as it could be, according to Michelle Segar, PhD, lead study author and an associate director of the Sport, Health, and Activity Research and Policy (SHARP) Center for Women and Girls at the University of Michigan in Ann Arbor. She says people have been taught to consider exercise as medicine and a tool to sculpt their bodies, yielding results that occur at some future time, which doesn’t prompt a desire to exercise. The idea of rebranding exercise emerged from the study in which women exercised for health, healthy aging, and quality of life, which they all valued equally as their reasons for exercising compared with their other life goals, Segar says. Researchers followed the study participants for one year and found the women who exercised for quality of life (to enhance how they experienced their day) did significantly more exercise than the other participants, according to Segar. The people who exercised for quality of life realized that when they don’t exercise, they don’t have as much energy and they are more stressed. However, when they do exercise, they have more energy, less stress, and improved mood. The benefits of these lifestyle enhancements result in their becoming more patient parents, snapping less frequently at a spouse, and enjoying their work more, all reasons that should compel people to make exercising fit into their lives, Segar says. 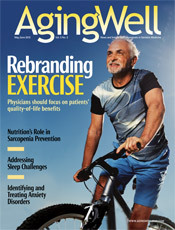 The American College of Sports Medicine (ACSM) and the American Heart Association have developed exercise recommendations for older adults, including promoting muscle-strengthening, flexibility, and balancing exercises, with emphasis on physical activity to maintain or improve flexibility and balance exercises to reduce falls. 3 And while these recommendations are important, Segar’s study points out the importance of recognizing behaviors that will motivate older adults to maintain healthful exercise habits. Karen M. Ross, MD, an assistant professor at the University of Oklahoma Health Sciences Center in Oklahoma City, recommends approaching exercise discussions by emphasizing the importance of older adult patients maintaining their independence or decreasing the risk of losing their independence. “Another thing that I see as a geriatrician is people who are coming in to see me because they want to maintain their current level of independence, or they want to extend that independence. So sometimes that’s a good motivator because they don’t want to be reliant on family or they want to delay that nursing home or long term care transition,” she says. Additionally, Ross notes there are numerous studies indicating that elders who suffer from chronic arthritis pain experience relief when they engage in physical activity. Putting the focus on exercise as an enhancement to quality of life is key to patient buy-in. “So it’s relaying this information differently to patients. The clinician can know that exercise helps the health and weight of their patients, but those reasons turn exercise into something that people feel that they should be doing, not that they necessarily want to do it,” Segar says. Gardner says she has a female patient who denied engaging in any formal exercise or physical activity. But Gardner later discovered that the patient does her own laundry several days each week, carrying laundry up and down a stairway in the process. “If she is able to carry a laundry basket up and down a stairway, then that’s good physical activity,” Gardner says. Angela Smith, MD, past president of the ACSM and an orthopedic surgeon at the Children’s Hospital of Philadelphia, suggests presenting the advantages of exercise to patients because doing so will likely produce positive results. “By taking a ‘fitness is fun’ approach, you promote the sense that the act of becoming fit should be fun and feel good too,” Smith says. As the rebranding exercise study showed, exercising simply because you’re supposed to do it is the kind of behavioral change that doesn’t really last. The behavior behind choosing to exercise has to be one of self-motivation because it’s of personal value. And the things that are of value to us, primarily, are things that make us feel good, Smith says. “Exercise has a very low risk relative to the benefits. And if we had any medication that was as effective as exercise that had a similar risk profile, we would certainly be prescribing it. A written prescription for exercise has been shown in several studies to positively impact the patient’s tendency to follow that recommendation,” Smith says. She also notes that physicians who appear to be fit or who say they exercise are more likely to convince their patients to exercise. “I think that those two things—writing an exercise prescription and being a role model—are important for a doctor who is recommending exercise. However, many people look at the advertised benefits of medications being marketed directly to the consumer through television and magazines. We should consider further marketing exercise to the consumer through those outlets, and I think that rebranding exercise as fun—not only as medicine—is a good strategy. In fact, that’s what I’ve always done,” she says. Smith says just as with medications, physicians can prescribe an amount and a frequency for exercise. For example, an exercise prescription could start out with telling a patient to walk for 20 minutes six days per week. Physicians also can prescribe more than one type of exercise. For example, she suggests prescribing an aerobic activity such as walking along with a strength or flexibility activity. Ross says informing patients of community- or hospital-based fitness programs is important for both physical and mental health. “Some of my patients have an insurance program that pays for their participation in a program called SilverSneakers, which is held at some YMCAs and other fitness facilities to bring seniors together to exercise,” she says. “Because the program is geared for older adults, it has been a big motivator for some of my patients,” she says. “However, while it’s a good program, it may not be actually pushing those seniors to the degree that adds to greater muscle mass and optimal endurance.” Individualized fitness programs are often needed to do this, she notes. But such programs provide great health benefits from a mental health standpoint and help to improve not only depression and anxiety in older adults, but may enhance cognition as well. “I’m seeing more and more patients who stay home and don’t get out and are in front of the television. Their health deteriorates at an alarming rate compared to someone who actually is getting out to the senior citizen centers or participating in community-based exercise programs. The health benefits of elder patients becoming physically active are multifaceted,” Ross says. — Jaimie Lazare is a freelance writer based in Brooklyn, New York. • Education: Teach your patients that their illnesses or disabilities do not prevent them from engaging in physical activity. For example, strengthening exercises can improve a patient’s arthritic knee symptoms. • Prescribe exercise: Patients tend to be more compliant about exercising when they are given written instructions. • Empowerment: Instead of just writing a prescription for exercise, also engage your patients in the discussion by allowing them to have a say in the planning and selection of physical activity programs For example, the 1986 study “Aging and Health: Effects of the Sense of Control” indicated that giving nursing home residents greater control over their health led to increased activity and greater self-reported happiness. • Socialization: Interacting with others while engaging in physical activity is a key motivator that helps promote physical fitness in patients as well as helping with mental health issues such as depression. By taking a tailored approach toward exercise, clinicians can help elder patients engage in physical activity designed to achieve immediate quality-of-life benefits that also have lasting healthful effects. 1. Bordicchia M, Liu D, Amri EZ, et al. Cardiac natriuretic peptides act via p38 MAPK to induce the brown fat thermogenic program in mouse and human adipocytes. J Clin Invest. 2012;122(3):1022-1036. 2. Segar ML, Eccles JS, Richardson CR. Rebranding exercise: closing the gap between values and behavior. Int J Behav Nutr Physl Act. 2011;8:94. 3. Nelson ME, Rejeski WJ, Blair SN, et al. Physical activity and public health in older adults: recommendation from the American College of Sports Medicine and the American Heart Association. Med Sci Sports Exerc. 2007;39(8):1435-1445.